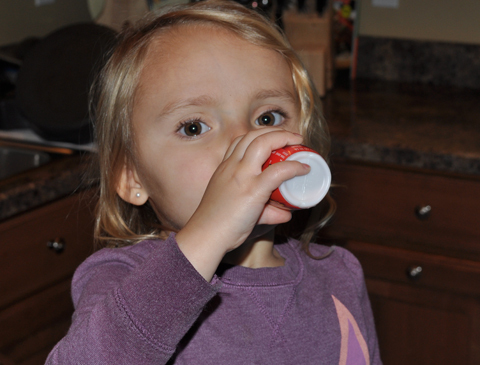 This time of year we like to cram a little holiday food crafts into our busy schedules. I saw this one for Milky Way Bar Teddy Graham Candy Cane Sleighs on pinterest and thought it looked like a pretty easy and yummy treat I could make with my granddaughter (age 3). 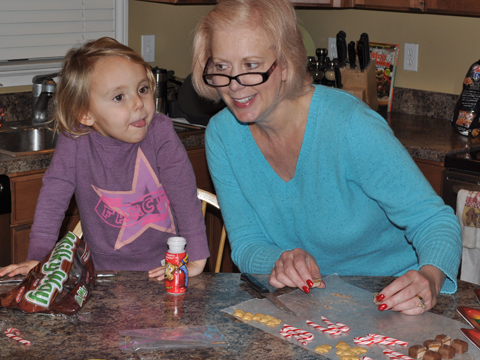 Since Grandma and Grandpa were babysitting yesterday evening, we decided this was the perfect activity for a little grandparent/granddaughter bonding. I did not read any directions ahead for this, I only looked at a photo, so these are my steps which may differ slightly from others. The way these are made is fairly simple. The candy canes act as the sleigh runners, the melted chocolate is used to “glue” the candy bar halves (the sleigh) onto the runners and the Teddy Graham bear is the sleigh driver. The first thing I did was cut the Milky Way bars in half. My candy canes seemed a tiny bit short, so I ended up cutting a bit more off one of the bar halves so they fit on the candy cane runners a bit better. You need two people to assemble the sleighs. Do this on wax paper as we found it to be a little messy. 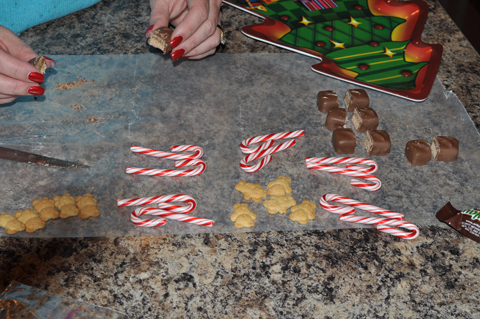 Have one person hold the candy canes in place on the wax paper while the other squirts the melted chocolate on the “runners”. I just snipped one small corner off my ziplock bag and the melted chocolate squirted out quite easilly. 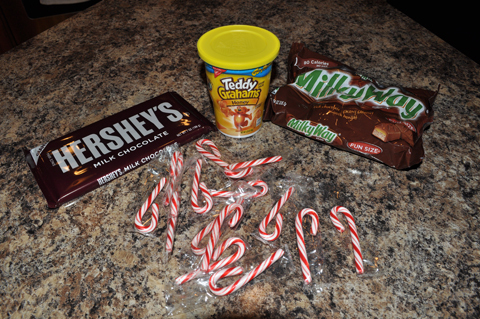 Sit the split Milky Way bars on the candy cane runners and stick a Teddy Graham in the middle. 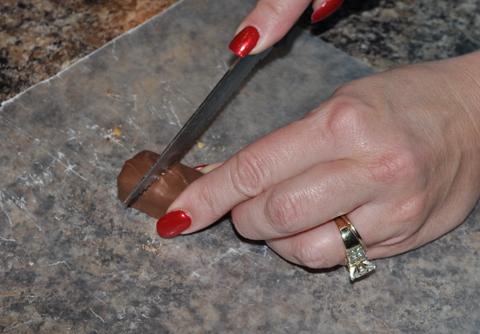 You have to hold it for a minute while the chocolate sets up. Note: I melted my chocolate just a tad too much so I placed it in the fridge for a couple of minutes and it worked much better. Take a break for refreshments and cutting up as needed! Also, feel free to eat any damaged Teddy Grahams or Candy bars that can’t be used for actual sleigh treats. Sorry there are no pictures during the actual assembly. It took both Grandma & Grandpa to put these together and little Autumn could not work the camera. We also got a lot of chocolate on us for some reason! We sat our tray in the fridge for a while to help them set up more quickly, but you could probably just set them out overnight. 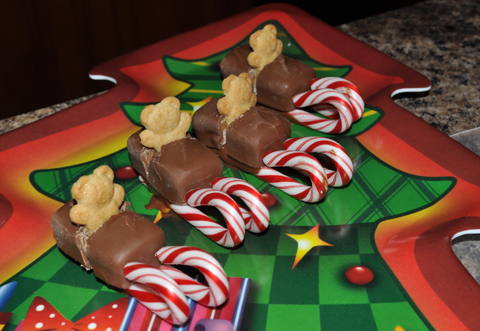 I thought our Milky Way Bar Teddy Graham Candy Cane Sleighs came out fabulous and I’m sure they are tasty! They may be gone by today, but they were fun to make! Footnote: After looking at these, my son commented that if you placed Oreo cookies between the runners in the front and back, they would then be the the “Sons of Teddy Graham Milky Way Candy Cane Bikes”! Sons of Anarchy fans may appreciate those! Maybe we’ll try it next year! In the meantime, it’s back to work. Stop by the Stitchwerx Designs etsy shop and see what’s new in great patterns for holiday crafting and gifts this holiday season. This entry was posted in Christmas Activities, Christmas Crafts, Food and tagged candy canes, candy treats, christmas treat activity, milky way bar, milky way sleigh, teddy graham sleigh, teddy grahams. Bookmark the permalink.